808 Smith Glass is a Toronto market leader, specialising in the design, installation & repair of aluminium framed wall windows. Offering bespoke, client-focused in-house design, we fabricate and install custom wall windows for a wide variety of clients. These include Toronto homeowners, high-rise condominium developers, commercial businesses, and hotels. What is a Window Wall? Window wall systems are a favorite contemporary design feature among Toronto architects and property developers. Aluminium framed wall windows require fewer framing components than regular wood, metal, or PVC windows. Window walls are, therefore, often used to showcase stunning panoramic views. Namely, by replacing exterior wall spaces with full height (and width) tempered glass panels. Bespoke window walls are often used to partition inner property areas. Lightweight but durable, window walls define atrium areas, stairwells, and add head-turning charisma to redeveloped historic buildings. 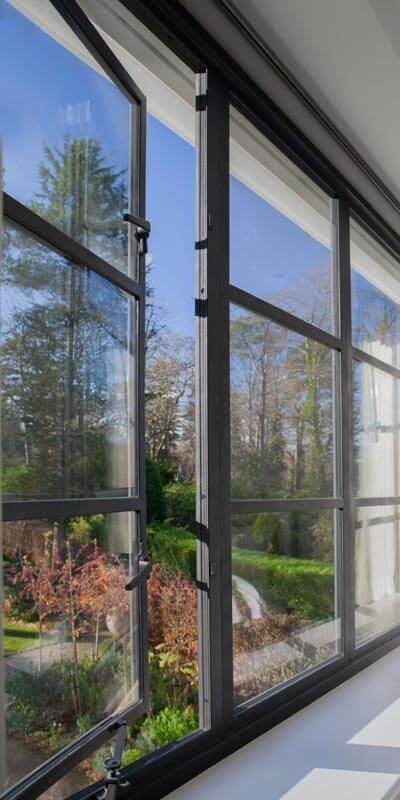 What is an Aluminium Window? Aluminium windows are the go-to design choice for Ontario architects. Unlike PVC windows, facades never fade. Nor do frames appear clunky or require replacement every 10-years. Instead, aluminum window frames are discrete, are more sympathetic to contemporary home styling, and require minimal maintenance. Aluminium window frames are thinner than PVC frames, showcase tempered glass panels to their fullest, and optimize in-home energy efficiency. Lightweight and highly durable, aluminium provides property developers and architects with unmatched design versatility. Aluminium allows property owners to benefit from sleeker, slimmer window walls. Breathtaking vistas can, therefore, be enjoyed from any vantage point. In many cases, aluminium framing components are barely noticeable. Instead, these merge seamlessly with existing property aesthetics. Unlike wood, metal, and vinyl, aluminium does not require staining or painting. Aluminium components in window wall facades benefit from a powder coat finish. This finish offers several years of environmentally friendly weatherproofing, compounded by the natural corrosion resistant properties of aluminium itself. Functionally, aluminium is durable, load-bearing, and easy to fabricate into a wide variety of entirely custom frame styles. This allows ourselves at 808 Smith Glass, to create bespoke glazing solutions which blur visual barriers between indoor and outdoor living spaces. In recent years, Toronto homeowners have voiced disappointment concerning the poor longevity of PVC and vinyl windows. Plastic and vinyl window frames yellow with age. Worse, mechanical component failures often require regular servicing. Toronto architects are also dismissive of vinyl. Because of this, aluminum reigns supreme as the preferred choice of material among commercial property owners, realtors, and new property developers. How Thick is a Glass Wall? Glass in an aluminium window wall will often be one-quarter of an inch in thickness. For added strength and safety, glass is also tempered or laminated. This equips window walls with extra strength and added shatter resistance. 808 Smith Glass transform the way people live and interact with their homes. We provide completely bespoke aluminum window walls suitable for ultra-modern luxury condominiums and traditional home renovations. Discover why we are the most trusted name in window walls in Toronto. Call or contact us now, and benefit from a free, no-obligation consultation concerning your next home upgrade. Looking to Remodel without Renovating? Frameless glass bathtub and shower enclosures are the perfect choice for homeowners. No other design feature can so completely transform the look and livability of a bathroom. To experience the benefits yourself, call or contact 808 Glass today for a free, no-obligation initial consultation.